Greed Island is the second of 3 Hunter x Hunter OVAs. 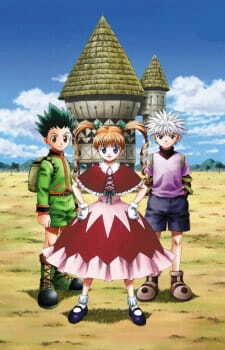 It chronicles Gon\'s search for his father, Jin/Ging Freecs. The only clue Gon has is the Greed Island game disc which is father left for him. Unfortunately he needs a special \&quot;Joystation\&quot; to play the game - and the Greed Island game is expensive (think $ Billions). Gon and Killua attempt to purchase the Greed Island game at auction. Thus begins the Greed Island OVA. Similar to the first OVA and the Hunter x Hunter series, the animation is what we\'re used to - good but not fantastic. The sound is great even though by now it\'s really predictable. Opening and ending themes are interesting though. The story is fantastic. Greed Island is a special NMORG (Massive Multiplayer Online Roleplaying Game) for Nen-users, and if a player\'s nen isn\'t good enough they will \&quot;game over\&quot; (DIE!). The premise seems simple but it\'s actually really exciting to play. Everyone competes to be the first to \&quot;clear\&quot; the game by collecting 100 cards. Cards can be acquired in a number of ways - questing, helping others, trading or ... well, player robbing/killing. Not only is the world dangerous, but so are the opposition players! Well, the start of this is very exciting. After watching this you\'ll want to go out and buy a Greed Island game also. As a gamer I was hooked. Much to my NON-surprise, it seems some company capitalized on the success of the anime and made a Greed Island game. The story and development are great. This OVA is when Gon and Killua finally develop their signature Ultimate Techniques. The Greed Island OVA also introduces a very interesting new character, Biske (Biscuit? ), who looks like a young girl but is much more than meets the eye. * Can Gon and Killua qualify to play the game? * Will they be taken advantage of as newbies? * Are they going to be able to cope with cute, threatening or plain weird monsters? * How will they deal with other players with different motivations? Will they have a strategy to they survive player killers? Don\'t miss another exciting installment of Hunter x Hunter, Greed Island OVA 2! The story is the same as the manga and the new adaptation. For new viewers, it's just a lot of MMORPG fun. The classic 'sucked into the game' ritual. It's Sword Art Online, but a million times better and with an actual plot. Honestly, this is probably my favorite HxH arc besides York New. It's got a good balance of everything. Especially concerning the plot, it has humor and serious moments that really push the story forwards. On top of that, the logistics of the game itself are very well thought out and make it an interesting 'world' for our main characters to play in. For the time, the art is actually quite amazing. There are times where the characters are drawn a little strangely and seem a little disproportionate, but the animation is scarily smooth and fluid, and so much effort went into every single aspect of it. Believe me, you will forget that it's even an old anime at some point. I usually don't like the opening and closing themes of old anime. Honestly, I didn't like the openings and closings of some of the other OVAs in the old adaptation. But the ones in this OVA specifically were actually really good. They called to mind some sort of nostalgia that reminded me of Full Metal Alchemist Brotherhood, almost. They are reminiscent of struggle, hard work, and growth somehow. It's a strange way to describe an anime opening, but it's really what it felt like to me. The characters overall are the highlight of this show, besides the world-building. Both aspects shine in this OVA, but the characters undergo the most development. Gon and Killua are shown to not be invincible, but they are definitely on their way there. Watching their childish foolishness is quite heartwarming and realistic, as is their honest conviction towards the game. HxH has a great talent for portraying every character, whether they be a saint or a mass murderer, as likable and somehow relatable. Truly amazing writing. Overall, this was so much fun to watch. I can never get enough of this show! In all honesty, if you are a Hunter x Hunter fan, you definitely will not be disappointed by this. There absolutely no way. So I hope you watch and enjoy this. Have a great day everyone!